Capping is slang for shooting dead. Fools is slang for anybody that you don’t agree with or have a beef with. Capping fools is shooting people you have issues with. You know…the very mature and evolved way of handling business. 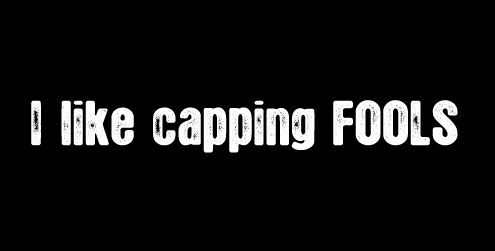 Capping FOOLS is a pun and wordplay and all kinds of goofiness, which pokes a little fun at the thug life. And I like it, but don’t the gangbangers that.